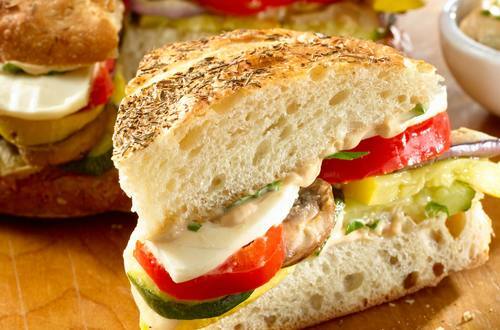 2 Combine Hellmann's® or Best Foods® Real Mayonnaise, basil, vinegar and garlic in small bowl. 3 Season vegetables with salt and pepper, if desired, and toss with 1/3 cup Mayonnaise mixture. Arrange vegetables in single layer on 2 rimmed baking sheets. Roast vegetables 45 minutes, turning once, until golden brown and tender. 4 Spread remaining Mayonnaise mixture on cut sides of focaccia. Top bottom with vegetables, cheese, then remaining focaccia. Slice into 8 wedges, serve warm or at room temperature.